The theme in these four films is the idea of what makes a person pathetic. From ruined romances to insecure actors to incompetent fathers, these films portray what it does and doesn't mean to be pitiable in their own unique ways. 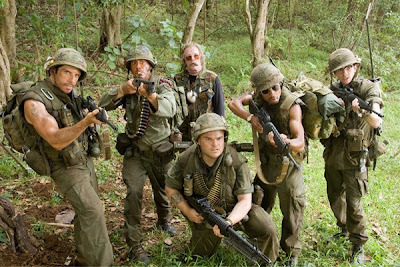 Tropic Thunder (2008): Crass, offensive, and pretty darn hilarious, Tropic Thunder is Ben Stiller's brainchild. The guy wrote, produced, directed, and starred in the film--you might as well change his name to M. Night Shyamalan. It's a satire about war films; in this case, a Vietnam war epic that is falling apart due to poor directing. In a desperate attempt to salvage the film, the director sends the overly cliche actors--the action hero, the comedic guy, the rapper-turned-actor, the Oscar winner, and the no-name with the only ounce of sense--into the drug lord-filled jungles of southeast Asia. The actors all have hidden struggles with identity and insecurity (except for the lowly unknown actor stuck with the famous ones), going to show that there are hidden insecurities in all our lives, even the most famous and put-together of us. The film has a great deal of offensive content in the language department. The film also caused some scandal for its portrayal of mentally disabled people. While I have to say that the satire and the performances were pretty funny--especially Tom Cruise in an unexpected cameo--it's a film that I'd struggle t0 recommend. If I were honest, there is very little edifying content to be found in the film. It's a well-made comedy with some very hilarious moments, but ultimately it's a satire of the mindless action films that continue to fill American theaters. Is it redemptive? Not really. Is it creative? Yeah, I believe it is. Is it sinful to watch it? Perhaps, depending on your conscience. Should you watch it? That's for you to discern. Proceed with caution. Forgetting Sarah Marshall (2008): This film is about as crass as Tropic Thunder, but focuses on broken romances instead of action films. TV actress Sarah Marshall breaks up with her composer boyfriend Peter at the onset of the film as Peter gets out of the shower. In a word: awkward. (Writer and actor Jason Segel said in an interview that the shower-breakup scene really happened to him in real life.) Devastated, Peter flees to Hawaii to recover and have a vacation, only to find that Sarah and her new rock star boyfriend Aldous Snow are staying at the same hotel. Again: awkward. But Peter also meets Rachel, the beautiful girl at the front desk of the hotel. Things with Rachel seem to be going well, until Sarah begins to have second thoughts about the breakup, leading to a dinner scene between the two couples. Yeah, it's awkward. The film is really one awkward scene after the next, yet with an authenticity about it that makes it bearable to watch. I've met people like Peter, who begins the film as...well...a big crybaby. He spends much of the first half bawling and lounging around feeling sorry for himself--i.e. pathetic. But the introduction of Rachel into his life changes everything. The film also does a good job of breaking the romantic-comedy formula of a) guy meets girl, b) guy and girl have stupid fight to create conflict, c) guy and girl live happily ever after. You're never quite sure which girl Peter will end up with, if he ends up with a girl at all. And all of the characters have some redeeming value; even Aldous, the seemingly-shallow new boyfriend has some depth to him. Oh, and did I mention the Dracula rock-opera? With puppets? Yeah, it's awesome. Overall, Sarah Marshall doesn't compare to former Judd Apatow comedies like Knocked Up and Superbad both in laughs and in redemptive content. While those former films have some incredibly deep insights into the human condition that balance out the raunchiness, this film is really just a well-made romantic comedy. It's like The Break-Up, only funny. Like Tropic Thunder, even though I personally enjoyed parts of the film, I'm not sure I could recommend it; proceed with caution and discernment. Snow Angels (2008): This is one of the dreariest films I've seen this year. And I watched No Country for Old Men and There Will Be Blood. Set in a snow-covered small town, the gray-and-dirty-white environment set the tone for the entire film. The story is really two parallel stories that intersect at key points in the plot. A teenager finding romance with the new girl school also works with his former babysitter (Kate Beckinsale). Her estranged husband (Sam Rockwell) is doing his best to spend time with their daughter, but the tension between them is evident from the start. An interesting spiritual element in the film is Sam Rockwell's character, Glen, who claims to be a recently converted evangelical Christian after surviving a suicide attempt. Glen can't seem to hold a job, struggles with deep insecurities, and drinks incessantly throughout the film. He has terrible interactions with just about everyone he encounters, apart from his parents who coddle him. Yet periodically there are scenes of Glen praying, asking God to take away his pain and help him become a better person. 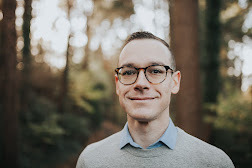 You're not sure whether he's genuine in his conversion, but he is definitely not what Christ has called us to be (violent, angry, irresponsible, selfish, etc.). I can't share much more of the plot than this, because I feel like there is great value in going into the film with as few preconceived notions as possible. As I was watching the story unfold, a wide range of emotions went through me--tension, sadness, laughter, delight, pained empathy, etc. It's really an eclectic film that focuses on how small choices can lead to devastating consequences. I really loved director David Gordon Green's George Washington, and this film deals with similar themes--intergenerational friendships, our response to personal tragedy, and dealing with ongoing pain. Don't expect to feel very happy as the credits role, but if you want an artistic film that deals with pain, watch this film. 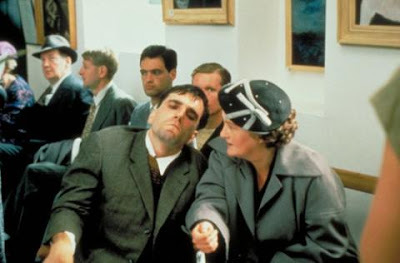 My Left Foot (1989): While the other three films center around pitiable and insecure characters wrestling with their own identities, this film centers around a bold and determined man with cerebral palsy. Diagnosed as mentally disabled as a child, Irish writer Christy Brown could not verbally communicate and only had physical control of his left foot. Driven by his artistic passions, Christy learned to paint and write using his left foot, eventually becoming a famous Irish author for his autobiography. Daniel Day-Lewis won his first Oscar for his amazing portrayal of Christy, and child actor Hugh O'Conor should have been nominated for his performance as the adolescent Christy. Christy is not without his faults; he is moody and arrogant at times, but still manages to overcome great physical and societal obstacles in creating his art. It's a great story with some powerful performances, and I'd highly recommend the film simply for Day-Lewis' portrayal of a man with a broken body but a very alive spirit.